With a name like Butlins Bingo, you would expect to see a red coat or two, or at least something to tie them into the holiday park, but with the exception of a small link to the official Butlins web site, you would not know that the two were connected at all. Their homepage uses an attractive purple colour scheme and they state that ‘Using their renowned skills in the world of entertainment, Butlins Bingo promises thrills and excitement you can experience at any time of day!’. So let’s take a look and see if they live up to this bold claim. The actual design of the homepage is simplistic but also quite classy. 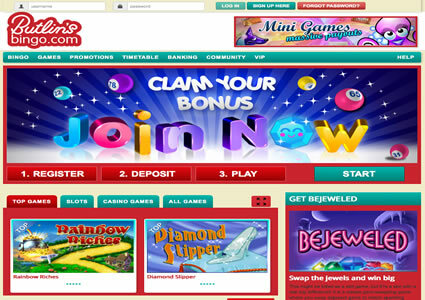 Unlike the majority of bingo site out there, they have not resorted to filling the screen with flashy graphics. Down the left hand side you have a series of links, and to the right is just one graphic displaying the value of their Giant and Snowball jackpots. Scrolling along the top of the page is a list of their most recent winners and their prizes, and some of the figures involved certainly make it hard to resist signing up for an account. When you do come to register with Butlins Bingo, it is a simple two stage process. The first step asks for your name, email address, date of birth and optional mobile phone number. In step two you will need to come up with a login name and a password, and this name must be different to any existing logins you have for any other sites on the G2 Gtech network. At this stage you do not need to enter any credit card details, as they will welcome you with a no deposit bonus so you can get a feel for the place. If you then decide to play for real though, you will earn bonuses on your first three deposits. Head to the lobby and you will just four bingo rooms, but they do offer 75 ball, 80 ball and 90 ball bingo. From the lobby you can see the time until the next game starts, the price of the cards, the number of players taking part and the value of the jackpot you could win. Butlins Bingo is also home to massive range of instant games including slots, scratchcards, progressives, casino games and arcade games. If you don’t fancy searching through them all though, a selections of the most popular ones are listed as features games, but you can only access these once you have deposited. 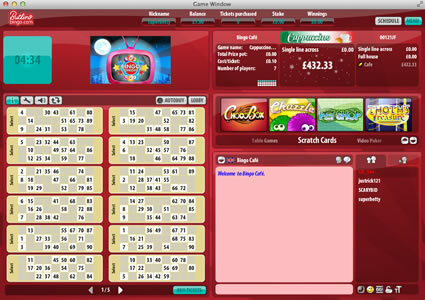 The actual bingo rooms are quite slow to load, but bare with it as you will be pleasantly surprised when they do. The G2 Gtech software is nicely designed and the colour scheme of the rooms match the rest of the site. To the left of the screen you have a chat room with plenty of fun emoticons and acronyms built in, and just above this a number of mini games. The right hand side of the screen is dedicated to displaying your cards and they are well laid out and easy to follow, which is particularly handy if you want to mark your cards yourself for a change. Butlins Bingo know how important the social side of the game it to their success so have put together a really useful community section too. In here you can refer a friend, meet the Bingo Live crew, find out a little bit more about their Chat Masters and even learn the Bingo Lingo. This include all of the acronyms you will see whilst chatting such as ROFL, TTYL and TYVM to name but a few. These are always worth learning as it will save you loads of repetitive typing in the long run. In this section you can also learn about all of the different options available in the chat rooms, so you can customise the gameplay to suit your own needs. Just like all of the other sites on the network, Butlins Bingo offers a great selection of games and promotions including free bingo and plenty of guaranteed cash jackpots. There is always something new and exciting going on, for you to get your teeth into, so there is no way you will ever find yourself bored. With the free no deposit bonus money they offer, you have nothing to lose by registering and taking a look for yourself, and you may just find the G2 Gtech software makes a refreshing change from the norm. 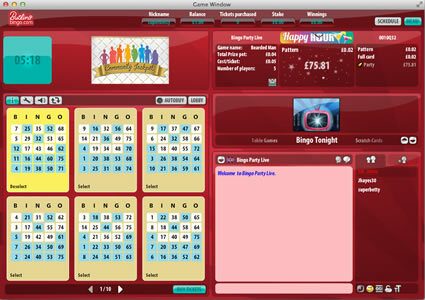 Butlins Bingo runs on the popular Gtech G2 software, and this allows them to offer you plenty of games to choose from. There is 75 ball, 80 ball and 90 ball bingo plus a great range of slots and instant games, all of which can be accessed from inside the bingo room. The downside to the software though, is when you come to play these mini games, they actually take up a large chunk of the chat room, making it difficult to follow the conversation. The software has plenty of options built in, including lots of smilies and emoticons in the chat room which save you repetitive typing when wishing people luck or congratulating them on their wins etc. You can have your cards auto daubed and have your best cards on display. If you need to go out or just step away from the computer, you can use the auto buy feature which will automatically purchase and play your cards for you once you have selected the number of cards per game, the number of games and the price you are willing to pay. 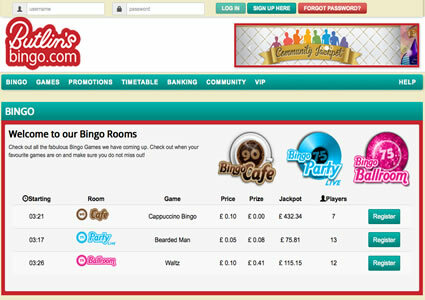 Butlins Bingo is part of the G2 Gtech network, and is home to great range of promotions. Their regular line-up includes guaranteed jackpots, progressive jackpots, penny bingo, free bingo and a whole host of other special offers designed to keep you going back for more. In addition to this, every time you wager a minimum of £5 of seven days, you receive the free daily scratchcard where you could win up to £100. The good thing with the St Minver network is that they like to look after all of their players, so in addition to the bingo promotions, you will usually find something for the slots players too. They have a Value Slots Clubs, and each month they select some of their most popular slots games, and give you the opportunity to play them to your hearts content for just a penny a spin. On top of all of this though, they also add monthly specials to their line-up, and it is through these that they give away physical prizes such as electrical goodies, holiday, shopping vouchers and tickets to gigs and sporting events. Butlins Bingo give away over £1,200 worth of guaranteed cash jackpots six days a week. These special games run for one hour between 9pm and 10pm every Monday, Tuesday, Wednesday, Friday, Saturday and Sunday night. Before you start panicking, we have not forgotten about Thursday night, as this is the night they kick things up a gear. On Thursday nights, the prize money is doubled to a whopping £2,500 and you can join in the fun via any of their linked rooms with the exception of Bingo Party Live. At the end of every month, Butlins Bingo hosts a special two hour long bingo session. Between 8pm and 9pm is the warm up hour but between 9pm and 10pm, there is a whopping £10,000 up for grabs. The highlight of this hour is a Jackpot Genie game, cards cost just 50p each but there is £6,000 worth of prize money to be won.